17th century copper-plate engraving presented in a hand-made venetian style frame, with an etched ‘Greek-key’ border. Exclusive to Dinan & Chighine. Hortus Malabaricus ( “Garden of Malabar”) is a comprehensive treatise that deals with the properties of the flora of the Western Ghats region principally covering the areas now in the Indian states of Kerala, Karnataka and the union territory of Goa. Written in Latin, it was compiled over a period of nearly 30 years and published in Amsterdam during 1678–1693. The work was conceived by Hendrik van Rheede, who was the Governor of Dutch Malabar at the time. 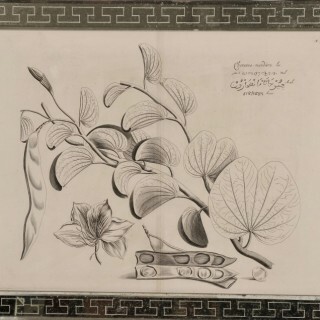 The engravings from the Hortus Malabaricus are believed to be the earliest prints on the flora of Asia and the tropics.